Congratulations to Vincent Elio for being selected to ride in the Summer 2019 Journey of Hope in support of the Ability Experience! Please take the time to visit Vincent’s website and support him in his endeavor. Vince must raise a total of $6,000 and he cannot do it without your help. Thanks for supporting Vincent and the Gamma Gamma Chapter of Pi Kappa Phi! Welcome to the National Award Winning Gamma Gamma Chapter of Pi Kappa Phi. We are glad to know that you are showing interest in our fraternity. 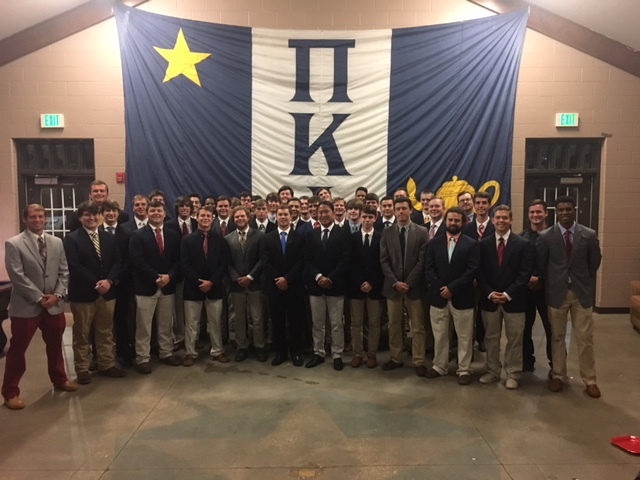 As an active chapter, we strive to live by Pi Kappa Phi’s motto, “Leaders By Choice.” In order to do this, we hold leadership roles on campus such as, Vice President of New Member Recruitment of IFC, Freshman Forum, IMPACT Leaders, and Supervisor of Officials for Intramurals. Our active chapter currently consists of 42 men who all do their part in making Pi Kappa Phi the best fraternity at Troy University. Pi Kappa Phi started the Greek Organization at Troy University as the first established Greek Organization after a 2-year campaign to bring Greek Life to Troy. You can read more on how we started by using the history link. In 2018, we have currently raised over $4,300 for our philanthropy, The Ability Experience. In 2019, our goal is to raise $5,500. Our past Archon, Vincent Elio has also been selected to ride in the 2019 Journey of Hope next summer. In 2016 we raised over $24,500 which included; the Journey of Hope in which our past Archon, Ben Barnett, rode cross country from California to Washington D.C, raising over $15,000 locally to assist one of Troy University’s Professors that was in need of a seeing eye device that was destroyed in a house fire and over $3,500 to The Ability Experience. We also supported several local special needs organizations and our chapter is continuing to set the standard at Troy University. Pi Kappa Phi’s Ability Experience is a nonprofit organization, which supports people with disabilities. In order to support our philanthropy, we support the community by building wheelchair ramps and spending time with those who are not as fortunate as ourselves. Also, to increase fundraising and awareness we strive to participate in National Events such as Journey of Hope, Gear Up Florida, Ability Camp and other events increasing awareness of those with disabilities. As you can see, our philanthropy “The Ability Experience”, is one of our top priorities. We are very proud that our chapter is an annual National Award winner due to our success in supporting the Ability Experience. We have also earned three Master Chapter Awards in Campus Involvement, Service and Philanthropy and in Branding and Communication. Academics are also a priority and we earned the National Most Improved in Scholarship Award. Our National Standard requires a 2.70 individual and chapter GPA to remain in good standing, which is much higher than the University standard of 2.50. We were ranked third in GPA of all fraternities during the Spring 18 Semester. Our goal is to continue to be ranked in the top three of all fraternities at Troy University. We also have the Dr Doug Hawkins annual scholarship sponsored by our alumni along with the annual National Pi Kappa Phi scholarship. For the sports minded individual we enjoy year round sports activities and have earned the 2016 Best Sportsmanship for Troy University All Sports events. We participate in all activities such as football, softball, basketball and soccer to name just a few. As you can see, our involvement is far reaching and is recognized as the Home Of Leaders. I encourage you to review our web site, read more about our Philanthropy, see our brothers and review our awards. We have much to be proud of as Pi Kappa Phi brothers at Troy University. We look forward to meeting you and encourage you to meet the challenge and become part of the first established fraternity at Troy University, Pi Kappa Phi.